An interesting tactical battle between two of the top teams on the planet. Pep Guardiola finally really beats Roger Schmidt with a very interesting and fluid system. Leverkusen executed their usual game plan of intense pressing and lay-off/combination focus in transitions, but Bayern was able to nullify both of these aspects in a unique way. Leverkusen had their typical approach with only minor changes. They had compact pressing in a 4-2-2-2 and focused on controlling the center while maintaining a high level of coordination and constant access to the opponent as a team. Schmidt’s teams are always impressive in these ways – involving a high number of players on the field in the pressing actions. In possession of the ball they played a very vertical and “risky” passing style which was sought to be stabilized by intense counterpressing stemming from their compact structure. The fact they focus so highly on quick vertical play and the value of lay-off passes results in some nice anticipated collective movements which are difficult to defend. A few times in the match Bayern struggled to cope with an off-ball run which began a few passes before the option became obvious for the ball-player (and therefore the defense). For example, if the ball was won and played immediately forward into Mehmedi, Bellarabi would’ve already started his forward run from the time the ball was won and would time his breakthrough in relation to the lay-off which the striker would inevitably give to an on-coming midfielder such as Bender for a first time through pass behind the defense. Because the players are accustomed to this game-rhythm and have experienced the general patterns multiple times, they are able to make movements far in advance and therefore create an attacking move which can be difficult to react/anticipate to in full speed from the point of view of the defense. The first aspect of the team’s shape which was noticeable was the asymmetrical back 3 of the team. Alaba played as the central defender in a line of 3 with Bernat high on his left and Lahm level to him on the right. Not only was the back line off-set, but Alaba and Lahm played in what most would consider traditional right and left central defender positions (and these 2 players fit well for creative central defender roles in build-up) while Bernat acted more as a left fullback – meaning this “back 3” looked more like a back 4 which was missing its right fullback. This asymmetry within Bayern’s shape caused a few problems within Leverkusen’s pressing throughout the game due to the orientation for positioning, pressing runs, and use of cover shadows of Schmidt’s players which normally stem from the opponent’s positional structure. The full red versions of Alonso and Vidal symbolize their ordinary positioning within the shape of the team. From the basic structure it looks mostly like an asymmetrical 3-3-1-3. But within this structure Alonso frequently dropped between the central defenders of Alaba and Lahm to form a different variation of a back 3 which you would normally see in a typical 4-3-3 when the pivot drops between the central defenders. On top of that, Vidal played an interesting role (which fits someone with his ability and stamina) where he played as an 8 but frequently made long movements towards the touchline and acted mainly as the team’s right wing-back within the structure. Muller would move from his 10 position to the right wing-back position at times as well while Vidal remained in the center – these two frequently balanced each others positioning within the structure. As a result, the team could move from an asymmetrical 3-3-1-3 fluidly into a 3-4-3 shape which would normally result from the pivot dropping between the central defenders in a 4-3-3 shape. When the team moved into the 3-4-3 shape Alaba could play the “halbraum libero” role in which we have been accustomed to seeing from him when he is the left half-back in a back 3. Lahm could also be more adventurous from his right half-back role now – while playing this role less dynamically than Alaba can. In these movements Muller can drop deeper into an 8 role with Thiago – there were many times in the game where combination play stemming from a group formed between Vidal, Robben, and Muller on the right resulted in penetration and dangerous situations. 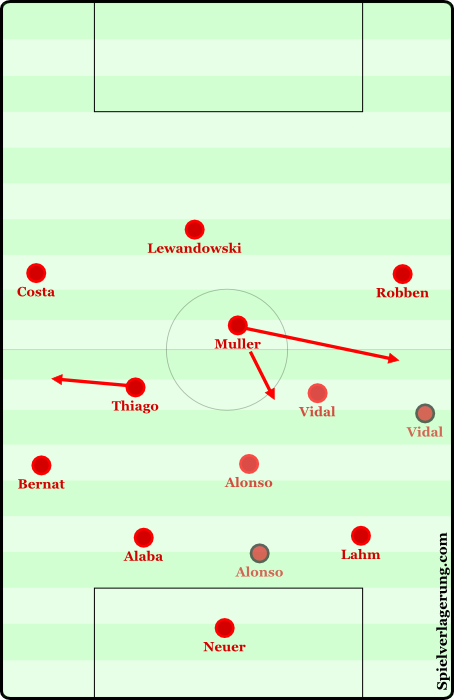 Remember that Muller moved into the right wing-back position at times as well while Vidal remained the 8 – resulting in different group dynamics being formed across the field. Not only did Bayern move between these 2 structures and the different roles for the players within them, but they’d play in even more variations of structure. Alonso could choose to not drop between Alaba and Lahm depending on specific cues while Vidal still moves wide – forming a 4-3-3 instead of an asymmetrical 3-3-1-3 or 3-4-3 shape. Or Alonso can decide to drop but Vidal decides not to move wide and then an entirely new structure forms (like a 4-2-3-1, depending on the movement of Muller) with different roles for each player within it forming as well. So the basic positional structure that Bayern began with that I call the “asymmetrical 3-3-1-3” can also be viewed in a way as an incomplete 4-3-3 shape where the right fullback is missing and has moved inside of the field! Sometimes the back 3 of Bernat, Alaba, and Lahm would behave like a typical back 3 with 1 central defender and two half-backs instead of having an asymmetry. Or when Alonso dropped between Lahm and Alaba a back 4 would form with Lahm and Bernat as the fullbacks and Alonso and Alaba as the central defenders – the roles and structuring was dependent on the situation and the problems which came with them. Muller’s movement between the 10 position, an extra striker, the 8 position, and a right wing-back position added even more variation to the structures and the dynamics of the groups which formed on the field – though probably the best one (which Guardiola likely noticed) was where Vidal, Muller, and Robben would combine on the right flank and either penetrate or create an opportunity to switch the ball to Douglas Costa. All of this movement and re-structuring from Bayern is nice, but it must have a value within the match – after all, such fluidity can have its downsides too. For example, in one scene when out of possession Lahm thought he could press up the flank because he believed Alonso was part of a back 4 (which he frequently created in defense), but Alonso had moved up into central midfield. This left Alaba deeper on the left side with a big gap on the right for Mehmedi to run into on the right behind Lahm – though it didn’t result in a good chance, the warning sign was there. With Thiago and Vidal frequently moving wide instead of occupying the halfspaces – they sought to increase the amount of space which Kramer and Bender had to cover behind the front 4 of Leverkusen, and therefore create gaps in which the ball can be played through vertically to gain space. As I mentioned before, the restructuring caused problems in the orientation of Leverkusen’s defense and put Bayern players into roles which fit them quite well – which they were able to change between depending on the situation. 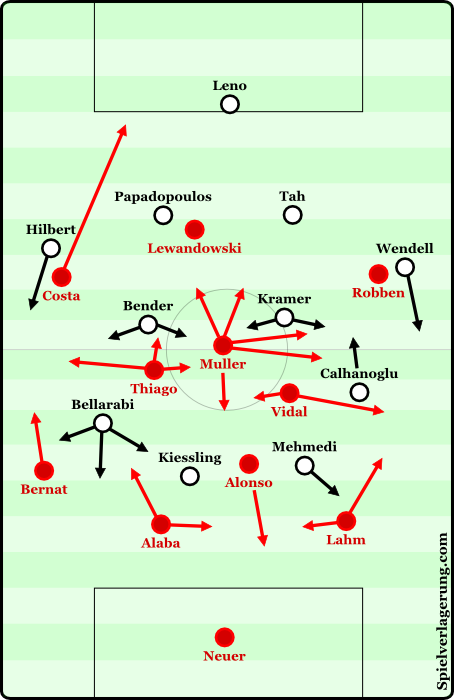 The main focus from Bayern was on accessing the players which moved wide and creating chances from there – which would normally end in penetration from either Costa or Robben. Bayern were able to frequently get the ball into either Thiago or Vidal in midfield (but wide) or into Costa and Robben directly due to the manner in which they tried to expose the areas to the side of Kramer and Bender in midfield. Alaba, Lahm, and especially Alonso acted as the creators out of the defense and frequently looked to expose the underloaded side of the field (something which is even more extreme with Bayer Levekusen) with long diagonals – such a pass from Alonso to Costa resulted in the first goal. Nearly every dangerous Bayern chance came from such diagonals or the play moving through Muller up the field. Lewandowski, Robben, and Costa played in quite normal roles in comparison to the rest of the team. Lewandowski played as the 9 and made some evasive movements (mostly towards his favored left) while also supporting build-up play with lay-offs. Costa and Robben had offensive-dribbling roles where they sought the beat defenders and penetrate into the box or play the ball into the center. These roles are obviously very good for such dynamic and talented dribblers – leading to Bayern Munich getting many chances from penetration in the halfspaces. The counterpressing and control of transitions from Bayern was still quite good in this match as each structure was mostly stable. Some problems arose when the players were no longer in transition and played in a defensive block (this doesn’t happen often against Leverkusen as they prefer a transitional rhythm, which could be a weak point of theirs in this context). The main shape Bayern sought to achieve out of possession looked like a 4-2-3-1/4-4-1-1 shape with Alonso joining the back 3 and Thiago and Vidal playing just in front of the back 4 – and the front 4 dropping back. The problems which arose stemmed from some of the long movements which Thiago, Vidal, and Muller would have to make in possession before moving back into their positions. Bayern attempted to pressure the ball frequently but lacked the proper compactness and coordination to do so. The front 4 would press but Vidal or Thiago would still be far from being in position and they’d fail to compact the area around the ball in the press and Leverkusen would easily pass through into midfield – some of Leverkusen’s most dangerous chances stemmed from these types of scenes. This shows the idea that positional stability is inter-relatable throughout all phases of the game and should be taken into account when creating a system altogether. Guardiola and his men were very impressive in this game, showcasing their ability to interchange and operate within many systems during a match and to flexibly solve problems for each situation. This resulted in the opponent becoming disoriented in some scenes and the creation of great chances from Bayern’s dynamic and creative players. Leverkusen still performed impressively in the sense of playing their high intensity pressing and vertical combination style. Though it was in the moments which they took a bit longer in possession that problems within Bayern’s system began to show. The worsened compactness and coordination in pressing while out of possession has shown in other matches under Guardiola this season – is this a necessary sacrifice in exchange for structural fluidity in possession or will Bayern likely fix these problems as the season goes on? My bet is on the latter! It looks like a very exciting season ahead for the Bundesliga as Tuchel’s Dortmund and Schmidt’s Leverkusen look to prevent Bayern from making Bundesliga history. Great article, Adin. Pep employing Xabi in dual role of DM/CB was genius. It’s incredible to see Bielsa’s tactics being used in Germany. Brilliant match and brilliant article! I have never seen such a positional fluidity of defensive players before, that was amazing to watch. And amazing to read now because you described it perfectly, thanks. Guardiola vs Schmidt is always a highlight. Think he is correct in saying they are similar offensively, no?